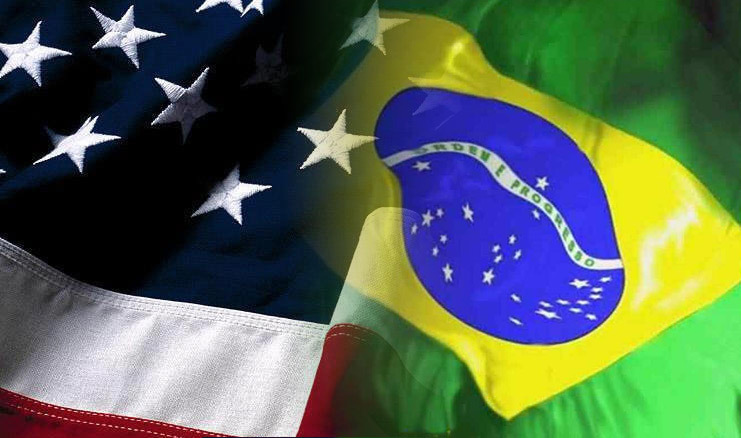 USA 1 – Brazil 4: A Misleading Score Line? 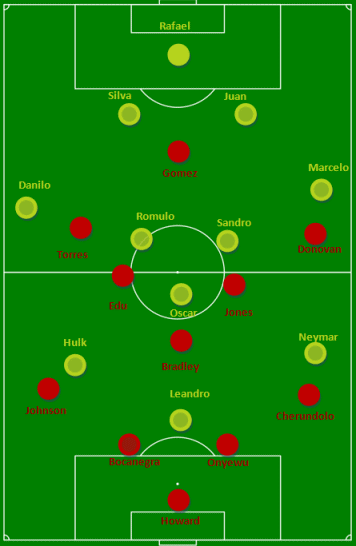 The conservative sensibility implemented for the Brazilian national team under former manager Dunga may serve as the underlying core of the current iteration of the selecao, but there’s plenty of the old samba style of play coming from Neymar and Co. It wasn’t just pretty play on the ball, though, that would prove to be a test for the USMNT’s new-found run of confidence–it was also the intense off-the-ball pressure of Mano Menezes’ dynamic 4-2-3-1. Jurgen Klinsmann countered with a variation of the 4-2-3-1 that replaces a traditional trequartista–or playmaker–with a 3rd central midfielder. We are calling this a 4-3-2-1. Unfortunately, the Americans were under such pressure that they often struggled to get out of their own half, making the formation a 4-5-1 much of the time. USA struggled to get out of their own half against Brazil's Barca-like, high-pressing 4-2-3-1. Considering the USA’s resounding success in the midfield vs. Scotland with the Michael Bradley/Jermaine Jones/Maurice Edu 3-man center midfield, the thought must have been that this same contingent could break up the play of Brazil’s midfield with a slightly more defensive stance. Bradley sat just ahead of the center backs while Jones bullied the right side of the pitch and Edu hung left. Much like Barca’s key to success is often intense pressure by the top line of 3, Brazil’s trio up top proved a tough test for the US center backs, especially a tentative-looking Onyewu. Bradley’s switch with Edu paid dividends in that it put the more skilled passer – Bradley – in a position to deal with Brazil’s pressure, but it also meant Bradley had to cheat forward to contribute in attack, leaving the Americans ripe for the picking in the center of midfield. Brazil, though, rarely took advantage of Bradley’s advanced positioned and instead headed to the wings where they made use of their two marauding fullbacks, Marcelo and Danilo. Ironically, though, it wasn’t creative tiki-taka play that led to Brazil’s first half goals, but instead a questionable PK and a practically free-header on a corner (Jones lost his mark on Thiago Silva). But there were some bright spots for the US in a first half that made them look like a bottom-table Spanish team being mesmerized by Barcelona, and they nearly all involved left back Fabian Johnson. He continually pressed into the Brazilian back line to make threatening crosses, and eventually took a visionary ball from Bradley and sent it back across the goal mouth for Gomez to knock in under pressure. Going to half-time with a sense of redemption, it seemed we had a respectable game on our hands. To Klinsmann’s credit, the US came out with initiative in the second half, but it was a failed offensive push in the 52nd minute that started a Brazilian counter attack spearheaded by the part-time forward Marcelo, who connected with Neymar and then took the ball past Howard. In this instance, Jones and Edu were caught in Brazil’s half, and though the backline and Bradley retreated into the box, there appeared to be miscommunication between Bocanegra and Bradley as to whom should pick up the charging Marcelo. The US, though, was resurgent. After Marcelo’s goal, they created 8 shots (4 on target) to Brazil’s 4 (2 on target). A shift to a 4-4-2 changed little up top, as the introduction of Clint Dempsey and Terrence Boyd made the squad’s shape more of a lopsided 4-3-3. Brazil maintained the same basic 4-2-3-1 all evening, but there was one big change. They stopped pressing. 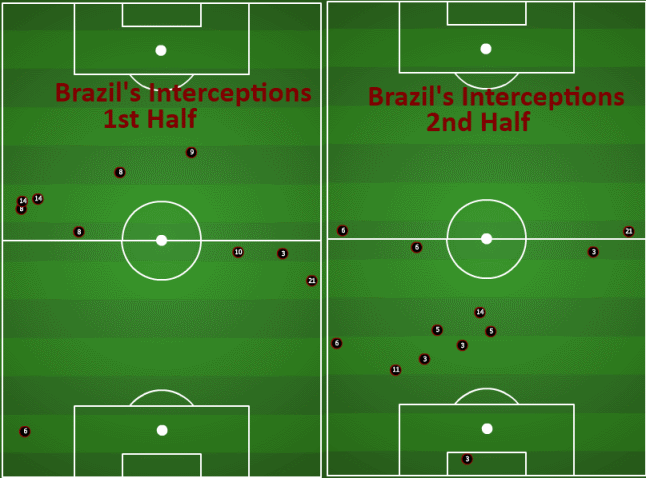 Notice how a tired Brazil was unable to intercept as many passes up the pitch in the second half. We’ve noted before that pressing is difficult. Not only is it difficult to carry out as a squad, it’s impossible to press for all 90 minutes. As Brazil tired, the United States thrived. Unfortunately for the gringos, goalkeeper Rafael, with an occasional assist from his backline and the crossbar, thwarted all the Americans’ 2nd half attacks. USA, on the other hand, pulled off shockingly awful defending in the final minutes, as Onyewu was caught napping and played substitute Pato onside, allowing the striker to beat Howard for Brazil’s 4th. Juanma Lillo, for all intents the creator of the 4-2-3-1, once noted that coaches, players, fans, and the media shouldn’t “validate the process through the results.” Yes, the US lost by three goals. Yes, three of the goals were a result of awful defending, and, yes, Brazil may have eased off the pressing a bit in the second half. But the match should count as a positive step forward. When Dempsey and Donovan were on the pitch, the Americans were the stronger side. That might not serve as much comfort in terms of tonight’s 90 minutes. But the goal is Brazil 2014, not Brazil 2012. Gringos, what do you think? Were you impressed by the end of the match or depressed by the poor sequences of defending? If this were a real tournament we should have switched back to the defend and counter style we used pretty successfully against big teams. However, it was a chance to see how well we could play the possession game against a very athletic, disciplined and skillful team. As we can see there’s still work to be done but the US did create about as many shots as Brazil so I think it’s a positive step forward. I would have liked to see Cameron instead of Gooch and that might be a key to dealing with pressing from the forward line. Oddly enough, this was a more impressive game in some ways than the 3-2 loss in the 2009 Confed. Cup. Bob Bradley – who did a great job with the US, in my opinion – shut down the attack for the entire second half, even when the score was level. While Klinsmann looked to defend first last night, the squad was proactive going forward the entire game. They weren’t always successful, but they were always trying. Granted, even though the US was down the whole evening last night and Bob bunkered so early in ’09 that he couldn’t do anything to get out of it, the aggression yesterday was nice to see. Jones/Edu as the forward CM pair didn’t work, though. I’ll try to get an article up on that topic before Sunday’s game against Canada. I agree completely on Gooch. Right before the game we tweeted our curiosity on how he would perform. Unfortunately it didn’t look solid back there. Would like to see Goodson get a turn beside Bocanegra vs. Canada. I wouldn’t be too quick to yank Gooch, unless you feel he is done at this level, or that Cameron or Goodson are vast improvements. He had a bad game against Brazil – who hasn’t had one of those. Let’s see how he reacts in the Canada game. I’m a little more concerned about the age factor with Bocanegra and Cherundolo. Honestly, I don’t see how Klinsmann can go too much longer with and aging Boca and a slow Gooch. But I’d be looking towards Boca’s replacement first, and I really would have liked to see Lichaj added to the squad to get some time at right back. Stevie C and Captain American definitely need to start giving way, at the very least to test some youngsters. I do, however, think Boca has an outside chance to be a contributor through 2014. His game has never been based on speed. He’s our version of Puyol and – like Puyol – the mental side of his game (positioning, ball retention, etc) is normally spot-on. Which is what makes his Brazil match so disappointing. He twice gave up the ball in awkward positions, with one of those poor decisions leading to a goal.